On 24 July 2017, the Boston Globe newspaper reported something which it appears came as a surprise to many people. Some had suspected the truth they exposed in their article, but not many. The subject was pedestrian crossings at busy road intersections. If you needed to cross the road, for example, in downtown Boston, you would press the “walk” button and wait patiently for the lights to change. Your assumption was that you set in motion an electronic process which reduced the time you would have to wait to get your opportunity to cross. As it turned out, however, this was an illusion. The buttons had been disabled. Pedestrians always had to wait a predetermined amount of time within the cycle of the lights. A spokesperson on behalf of the city of Boston explained that downtown was too congested with pedestrians and cars to allow any single person to influence the traffic lights’ cycle. This did not surprise everyone: one resident, who had suspected the buttons were only for show, said they were just there “to calm the tourists”. So, whether you pressed the button once or multiple times, it made no difference to the time you would have to wait to cross. With personal injury claims, however, you’d expect that persons with multiple injuries would be treated differently to people who have suffered single injuries, in terms of the value of their claim. Multiple-injury claims are indeed treated differently, but how exactly does it work in practice? In this article, we will consider 3 separate aspects of multiple injury claims. Firstly, what do we mean by multiple injuries? Secondly, what types of multiple injuries arise? And, finally, what are the factors which affect the valuation of claims for multiple injuries as against claims for single injuries? If you don’t want to wade through the details, there’s a summary at the bottom. 1. What do we mean by “multiple injuries”? If you have an injury to more than one part of your body then that’s getting into multiple injuries territory. The same applies, however, where you have both physical and psychological injuries. An apparent single injury – such as a broken bone – can be supplemented, for example, if it is a compound fracture (breaking the skin) and/or requires to be internally fixed with screws and plates. This will probably leave scarring, the cosmetic effects of which are often classed as a secondary injury. In some situations, injuries affecting more than one part of the body are lumped together into a single basis of valuation. For example, an injury resulting in amputation of the Ring and Little fingers on one hand – at least in terms of the standard guidelines used by insurers and lawyers – is viewed as a single, composite injury for valuation purposes. The more “multiple” the injuries, the greater complexity there is likely to be in valuing the injuries. 2. Which multiple injuries arise in practice? The variety of multiple injuries is infinite. Even where it’s a single injury, no two cases are ever alike in terms of the valuation of the injury itself. Things like a person’s age, the nature of their job (if any) and their hobbies can all affect the value. With that in mind, multiple injuries always tend to make things more complicated. Multiple physical injuries can be combined with psychological consequences and scarring. The initial severity and overall duration of each individual element will also have an effect. 3. 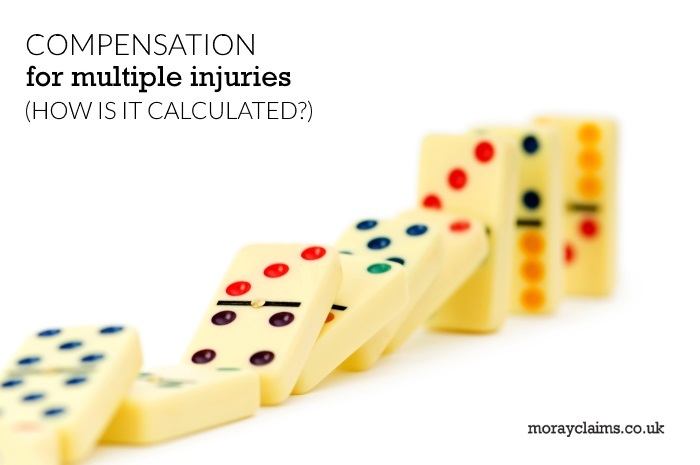 What is the effect of multiple injuries on the calculation of compensation in practice? In an effort to manage expectations, we generally warn clients that the value of, say, a broken leg and a broken arm for one person from one accident will probably be less than the total if the same two breaks were suffered by two different people – one getting the broken leg and the other the broken arm. There’s an example of this type of “discount” approach in an English County Court case from 2008. The case is called Sammie -v- Barber. The female claimant, injured in a rear-end shunt road traffic accident, suffered a neck injury and a wrist injury. The judge said that, on their own, the wrist injury was worth £1,000 and the neck injury £1,050. However, the award Ms Sammie received for her injuries was not nearly as much as £2,050. Instead, the judge’s approach was to take the £1,000 for the wrist and add on £250 for the neck injury – a total of £1,250. In other words, her claim for her injuries was valued only at about 60% of the total of the 2 injuries separately. Lawyers and insurers refer to guidance known as the Judicial College Guidelines (“JC Guidelines”) when valuing injury claims. The guidelines break different injuries down into varying levels of severity and then give ranges of appropriate values within each bracket. The judge in Sammie -v- Barber expressed the opinion that it was a fundamental error to value multiple injuries by assessing them separately in accordance with the guidelines and then applying a discount (i.e. in the circumstances, it was incorrect to apply a “discount” from £2,050 but correct to apply an “add-on” from £1,000). But was the judge in Sammie correct? 2017 has seen the publication of the 14th edition of the JC Guidelines. Helpfully, near the start, they contain a “Note on Multiple Injuries”. This acknowledges that the assessment of compensation applicable to multiple injuries can be a situation of “special difficulty”. The recommended approach is that taken by the English Court of Appeal in Sadler -v- Filipiak (2011). Ms Sadler’s car collided with another vehicle due to the fault of the other driver. The other occupants of the car were her two children, her friend and her friend’s child. All the children were injured and, tragically, the friend was killed. permanent facial and non-facial scarring. The judge who heard the case awarded £32,000 for the injuries. His approach to the valuation was first to form an impression of an overall figure and then break the award down into amounts for the respective injuries. Ms Sadler appealed to the Court of Appeal against this award and she was successful. The value of her injury claim was increased from £32,000 to £40,000. The court said it was wrong of the judge who first heard the case to form an overall impression of value and then seek to break it down. Instead, the appropriate method was to identify separate figures for each one of the various injuries and then stand back and assess whether that amount was sufficient for the overall injuries. equal to the sum of the parts. Pitchford LJ felt that some adjustment would be required in most cases. The award could be increased to reflect the combined effect of all the injuries on the victim’s recovering quality of life; but it could also be reduced in order to remove a perceived element of “double counting”. So, how did the Court of Appeal get to £40,000 in Ms Sadler’s case? Pitchford LJ referred to a couple of examples of earlier cases where particular approaches had been taken at the “standing back” stage. In Smith –v- Jenkins, the injuries were fractures to the right temporal bone (at the front/side of the head), right jaw and cheekbone. The court made no significant discount from the total of the individual injuries because the judge concluded that the effect of each one had made it, if anything, more difficult for the claimant to cope with the others. This could be interpreted as a situation where the injuries were all so close together in the body that they made each other harder to bear. The judge awarded £37,000 for the injuries. In Santos –v- Eaton Square Garage, there was held to be a clear overlap between chronic pain syndrome and a diagnosis of PTSD. The psychological consequences (PTSD) were related to the perception of pain originally caused by a crush injury to the pelvis. £27,000 for the psychological injuries and £8,000 for the orthopaedic injuries (£35,000) was discounted for a final award of £32,000 (which is still a deduction of less than 10% on the total). Contrary to the position in Santos, Pitchford LJ felt that Ms Sadler’s case showed no significant overlap between the psychological and physical damage she had suffered. Her PTSD stemmed not from her perception of her injuries (as in Santos) but from the horror of the accident circumstances. It was her grief reaction to the death of her friend in the accident which was the most important element in her psychological suffering. We’ve seen that, unlike pressing pedestrian crossing buttons in central Boston, multiples do get you more of a “result” than singles, when it comes to injuries to parts of the body and compensation. The principles are not entirely clear. It seems that, in theory, multiple injuries can get you the same level of compensation as all the individual injuries added together – or, in rare circumstances, even more than that. On the whole, however, there will be a discount once you’ve applied the correct approach of identifying all the individual injuries and adding them up. How much will that deduction be? Arguably, 10% of the total or less, though (to use one of lawyers’ favourite phrases) each case will depend on its own circumstances. We hope you’ve found this article on compensation for multiple injuries to be useful. If you’ve got any questions about this topic – or about the wider personal injury claims services offered by Moray Claims / Grigor & Young, please get in touch. Call either of our solicitors – Marie and Peter – on 01343 544077 or send us a Free Online Enquiry. We’ll help in any way we can and, often, if we can’t help you directly, we’ll be able to point you in the right direction.